You have children at home? You are bound to step on one of their toys once in a day for sure. They are practically everywhere! Your tot plays with them for 30 minutes, but they are seen lying around for the rest of the day. You have absolutely no clue as to where to shove them. These toys need to be managed, stored, and organized, but how? Toys come in a variety of shapes and sizes, and because of this not all of them can be accommodated into regular boxes. At the same time it is not economical to spend in new storage each time a new toy comes in. Given below are five fantastic ideas that you would definitely want to try that will help make space as well as organize toys. 1. Canisters: These make wonderful storage containers. You don’t have to have a creative bend either. Just add a bit of colour to the lids, some old animal or bird figurines and paint them up. They are attractive and will be able to stack up just anything and everything, for instance, Lego, crayons, stickers, markers, etc. 2. Pouches: These are not necessarily the small pouches or kits you are thinking. These are big enough to be attached to a bed or a cabinet or even to a settee. They can be your ideal place to stack up colour books, comic books, board games, plush toys, etc. 3. Old soda crates or bins: These can be affixed with wheels and can be carried anywhere. They are very handy and convenient. Furthermore, bins can double as a seating arrangement too. Also, you can have racks with plastic basket shelves or set-up trays to keep the toys. 4. Hanging baskets: Baskets have been used for an assortment of items. You can stack up your fruits and vegetables and you can use them for toys. They don’t occupy space and can be placed anywhere you like. 5. 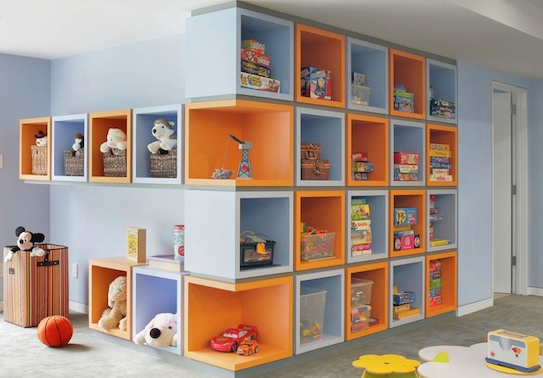 In-built shelves: They can be used for toys as well as books. You can add your funkiness to them and change the entire appearance of the room! Moreover, you will be freeing up a lot of floor space. Given above were five of the best storage ideas. You can always come up with some more creative ideas of your own and help avoid the mess your little one leaves behind.